On Friday, October 5, Dina Mardell, owner of Porter Square Books, CRLS Librarian Emily Houston, and CRLS Photography teacher Debi Milligan, hosted author Isabel Quintero and illustrator Zeke Peña for a presentation in the CRLS library to 100 students and teachers. 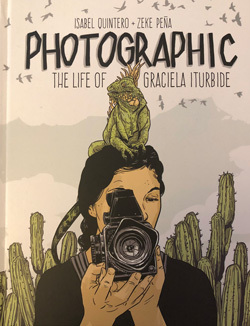 Their graphic novel, Photographic, The Life of Graciela Iturbide received the 2018 Globe Horn Book Award for Non-Fiction. The author and illustrator were in Boston to receive the award that evening. The book is the first biography of internationally known Mexican Photographer, Graciela Iturbide published in English by the J. Paul Getty Museum. The creative pair were introduced by advanced photography students Paloma Pellegrino and Carlos Paronis. Isable Quintero and Zeke Peña highlighted the relevance of photographer Graciela Iturbide's work and they shared information about the process of creating their graphic novel focusing on the richness of Latino culture, artistic community, and their personal creative lives as well. Students stayed long after the event was over to ask questions of the pair. The presentation was lively and interactive. Porter Square Books Foundation donated books to the photography students as well as to the CRLS Library and CPS upper school libraries.